I did some art for the New York Times travel section last week, art directed by Shannon Robertson and Angelica Rogers. The topic was legroom in Coach, something I'm familiar with after many years as a travel writer. (Every year it seemed the seats got narrower and closer together...or was I still growing?) The conversation in the column was about the aggravation and aggression that close quarters generate. I drew it two ways for them to choose from. 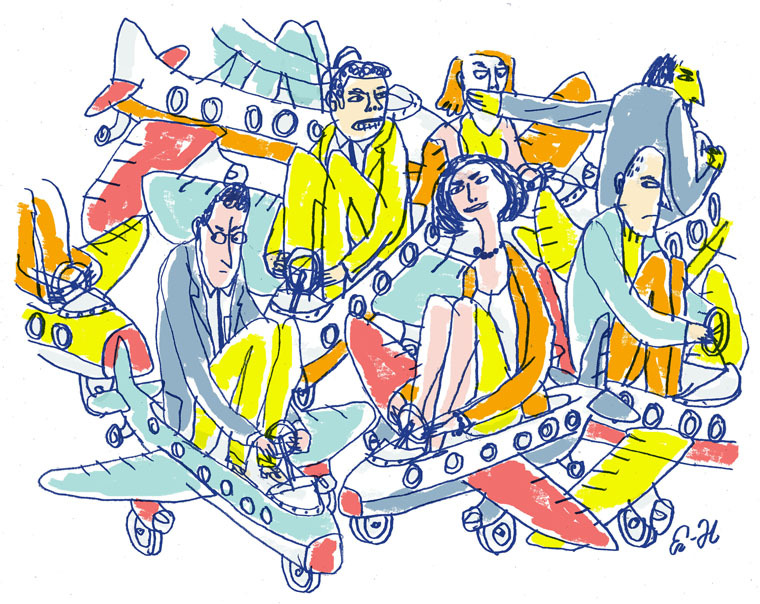 First I drew a conventional composition of unhappy travelers elbowing and scowling at each other. Then I tried to think what they reminded me of. Knees shoved up, shoulders hunched––and I thought of kiddycars, adults shoehorned into seats designed for children. This added the aggressive element that I was reading about. And why not make the kiddycars into small airliners? The space allotted for the illustration allowed me to decapitate two figures on the left, a natural consequence of modern travel.